Today we re-structure our Professional Scrum Master assessment (PSM) and certification products changing the focus of PSM II and introducing PSM III. In this blog I wanted to describe why we have done this and what it means to software delivery professionals. The PSM I, PSPO I and PSD I assessments provide practitioners with the ability to validate their fundamental knowledge of Scrum. And, by decoupling these assessments from Scrum.org classes we enable practitioners to prove that knowledge without having to attend a class. Of course, attending a Scrum.org class is the most efficient way of learning Scrum and building that knowledge, but it is not mandatory. After introducing PSM I, it was clear that fundamental knowledge is not enough for many organizations and Agile practitioners, so we needed to extend our assessment offering to include an assessment that determined if people could not only use the right words, and understand the fundamentals of Scrum, but also could apply those ideas to complex ‘real world’ situations. We needed to test future coaches, consultants and trainers. PSMII was created to do that very thing using a combination of essay and multi choice questions to test a practitioner’s ability to practice Scrum in complex situations. The results of PSM I and PSM II are key contributors to our capability validation and licensing process for Professional Scrum Trainers (PST). PSMII was too hard, and they did not want to be a coach or trainer instead they wanted to prove they knew Scrum at a level higher than at the fundamentals level. They wanted to be supported on their learning journey and use assessments as a tool to help motivate them and enable them to inspect and adapt. Assessments provide a great way of validating their learning and encouraging them to continue to inspect that knowledge. Initially we called this assessment Professional Scrum Practitioner (PSP). But found after running a series of experiments that the word practitioner caused some confusion. 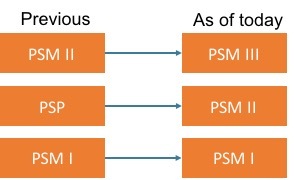 Hence going forward, we have renamed PSP to PSM II and the PSM II to PSM III. PSM I - People who have passed PSM I, achieving certification, demonstrate a fundamental level of Scrum mastery. PSM I certificate holders prove that they understand Scrum as described in the Scrum Guide and the concepts of applying Scrum. PSM I holders have a consistent terminology and approach to Scrum. PSM II - People who have passed PSM II, achieving certification, demonstrate an advanced level of Scrum mastery. PSM II certificate holders prove that they have an understanding of the underlying principles of Scrum and can effectively apply Scrum in complex, real-world situations. PSM III - People who have passed PSM III, achieving certification, demonstrate a distinguished level of Scrum mastery. PSM III certificate holders prove that they have a deep understanding of the application of Scrum, Scrum practices and the Scrum Values. Those who pass PSM III also have the ability to apply Scrum in a variety of complex team and organizational situations. This assessment includes essay based questions. So who should take the assessment and how should it fit into your personnel development roadmap? PSM I Everyone involved in using Scrum should have either a PSM I or PSD I or PSPO I. All of these assessments ensure a consistent level of knowledge and terminology. At the start of your Scrum journey either as you start working with or on a Scrum team. PSM II Scrum Masters and other Agile leaders / coaches and mentors. If you are being coached to become a Scrum Master use PSM II as a way to validate that coaching. It is not mandatory, but ideally you should take this after you have been practicing Scrum for over a year. PSM III This assessment is aimed at coaches, mentors and people who want to prove that they are expert in Scrum. The assessment requires experience. Ideally more than 5 years of Scrum experience. Of course every situation and experience is different, some years you learn 5 years’ worth of stuff, others you learn nothing. But experience is key for this assessment. The creation of the 3 level assessment family for PSM, combined training with our Professional Scrum training and community provided by our ever growing Professional Scrum Trainer (PST) group provides a great platform to deliver on our mission of improving the profession of software delivery. It provides assessment and validation that sits alongside training, coaching and learning. Ken Schwaber is famously quoted as saying about Scrum “Two days to learn, a lifetime to master”. With the PSM assessment family you now have a mechanism to guide you on that lifetime journey.